Most of the past few days has been lots of CAD work for the subsystem teams. Getting the first major subsystems ready to be sent to our laser sponsor, Solarcraft, and we are just about there. The new intake prototype was the main focus for testing this weekend. We only CAD enough of it so that we can assemble and build it quickly. 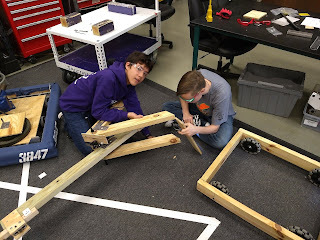 This weekend we removed the bumper which will force us to have a bumper gap in the front and back of our robot that we don't really want to do but it will let us intake far better. We also swapped one of the fairlane wheels that was intaking for different wheels and that stopped our center jam problem since now the other wheel can slip and the fairlane wheel can go over the corner of the cube and intake it happily. The gif below shows the much improved and non-jamming intake. We are very pleased that the intake is able to lift the cube up while it's in taking. Arm is also getting ready to be send to our sponsor as well. A ton of teams have been making build Vlogs this year on YouTube but they aren't the easiest to find. We've compiled a big list of Vlogs and video series from teams around the world. There are almost certainly more teams putting out cool content, so if you know of any we missed send us a link so we can add them to the playlist. The playlist only includes one video from each team to start but we'll try to add more as we find time. 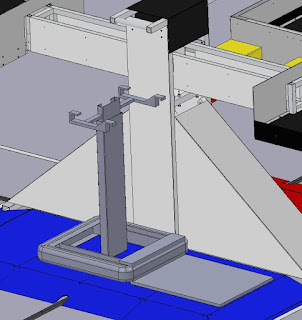 The CAD for our extending arm is moving along, we have bearing placements mostly finished and the gearbox packaging for the extension is all done on the arm sheet metal. Initial electronics layout is starting to take shape. Today was probably the end of the our 4 bar intake prototype. We had some goals for the intake design and it does meet some of those goals but we believe we can get comparable performance from a much simpler intake design. As we tweaked this design the best grip and intaking occured without the rear wheels even touching the cube and if you don't need the rear wheels than you don't need the 4 bar. 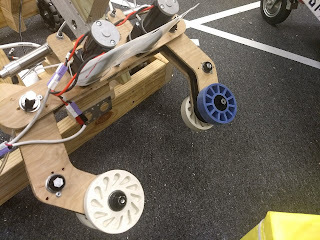 Since the first week we knew that if we couldn't get the intake wheels to launch a cube the way we wanted we'd probably need to use a pneumatic punch. We had done some very basic tests the first few days of build season but we hand't mounted a cylinder to an intake until tonight. 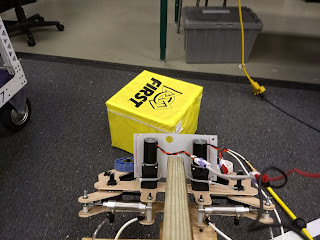 This is a simple prototype but it shows the proof of concept to allow us to punch the cube up and in to the scale or to the back of a switch plate. Intake prototypes are finally running, took a little longer than we wanted with the ice days last week. It's working well for most cube orientations but we still aren't full go on this version of the intake. We have the intake mounted on to our mock arm and will be testing tomorrow how well it works at an angle. We have some ideas for how to improve in-taking at a steeper angle or possibly reducing the angle. There isn't one perfect intake for every design find that one that integrates with the rest of your design. The CAD for the arm is coming together. Hook geometry to starting to take shape. 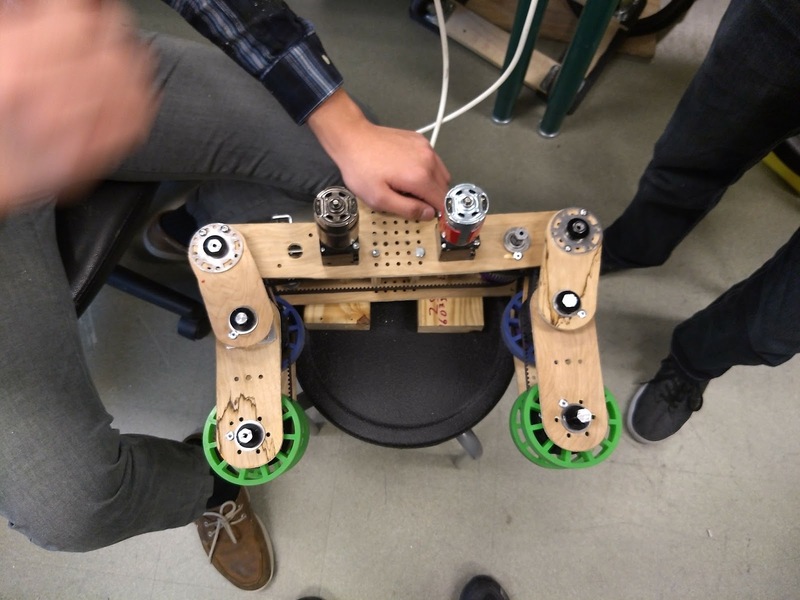 We love this video by Adam Heard and 973 for designing pneumatic linkages. Arm pivot is more flushed out, we'll be using a colson dead hub in a way it wasn't designed for but it should serve us well in this new role. We did have our first meeting back after the winter storm. Most of the team spent the day at Memorial Hermann Hospital getting a tour of the new "da Vinci Xi® Surgical System." 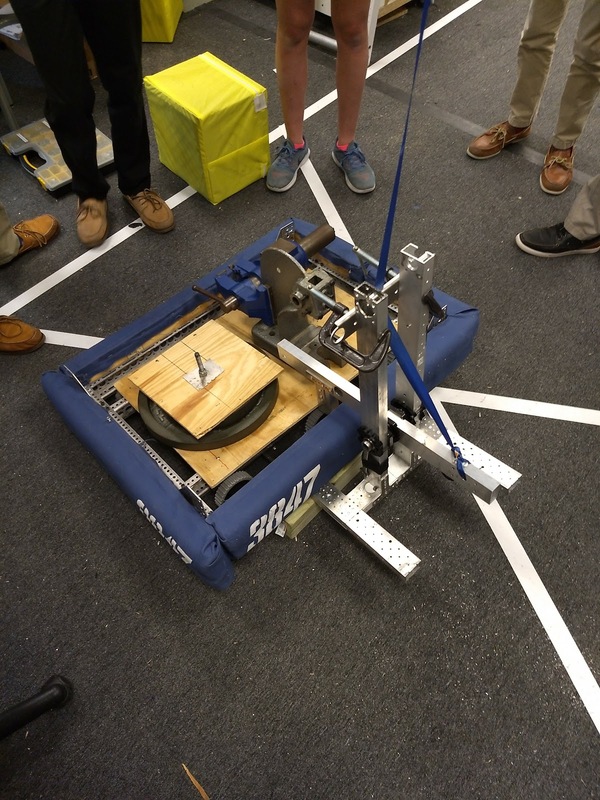 We were able to see real world applications for the technology that we learn in FRC. We should have photos soon. We progressed on the virtual four bar intake. 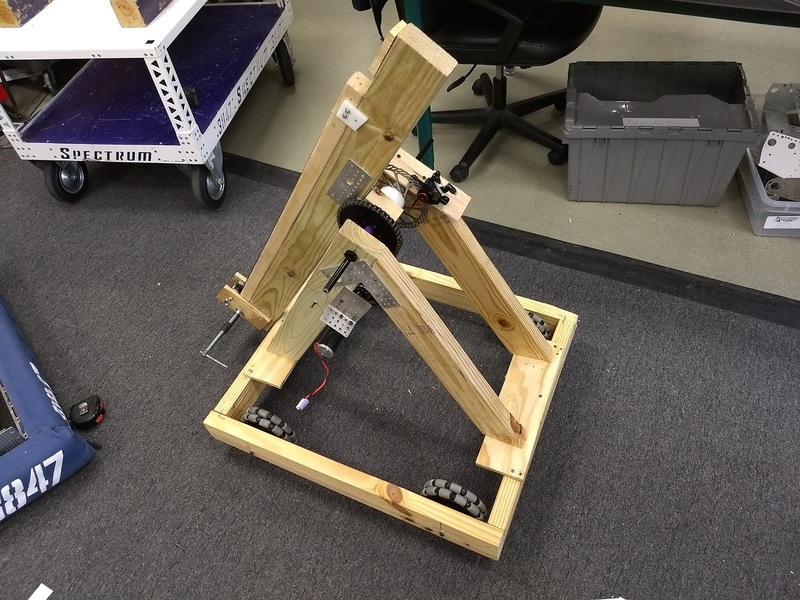 This prototype has some issues and we have begun building the 2nd version to fix most of the problems. The gif below show you how the arms actually move. 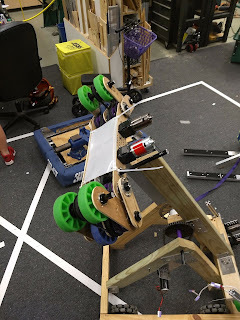 We are also looking into systems for folding out our climber hooks and also keeping our tailgate winch cable organized while it is attached to our extension arm, our current plan is use coiled pneumatic tubing to allow the cable to stretch and retract as needed before pulling it in to tension at the end of the match. This is our current drive train gearbox plan. This may still change but we are looking to be very fast this year. The amount of full field runs may down this year but it is very possible that we will crossing the field width wise regularly from portal to scale. We couldn't meet Tuesday or Wednesday this due to hazardous road conditions and closed highways. We are too the stage we call Block CAD. None of parts are how they would actually be manufactured but they are more than just two D sketches. If we have prototypes CADed of the systems we can use those as place fillers but a lot of the elements are just simple extrusions based on our previous sketches. This stages helps get robot from just a bunch of collective thoughts to something with a little more detail. You can start seeing in 3D where you care going to have packaging problems and where you need dedicate more thought to your final solutions. Side view of the robot with the arm in multiple positions. The final intake won't have motors sticking out the top to allow it to flip from side to side. 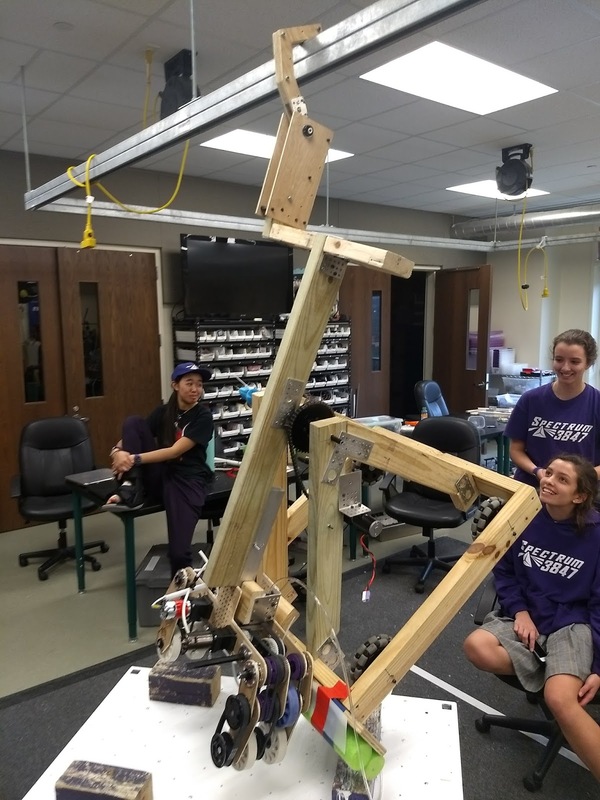 Side view of the robot with the tailgate attached and shown in the up and down positions. Head on view with the arm straight up. Easy to see how a fold out hook will be able to latch on to the square tubing of the rung. Head on view with the intake tilted at the frame perimeter, this is if we are potentially reaching over another robot that is already hanging to grab the rung. This position show the length of the robot during it's curled position. The final size will add a few inches for bumpers and any length that we make the hook. There are still tons of details to iron out with our systems. If you're looking for more FRC content check out the Robozone Podcast. 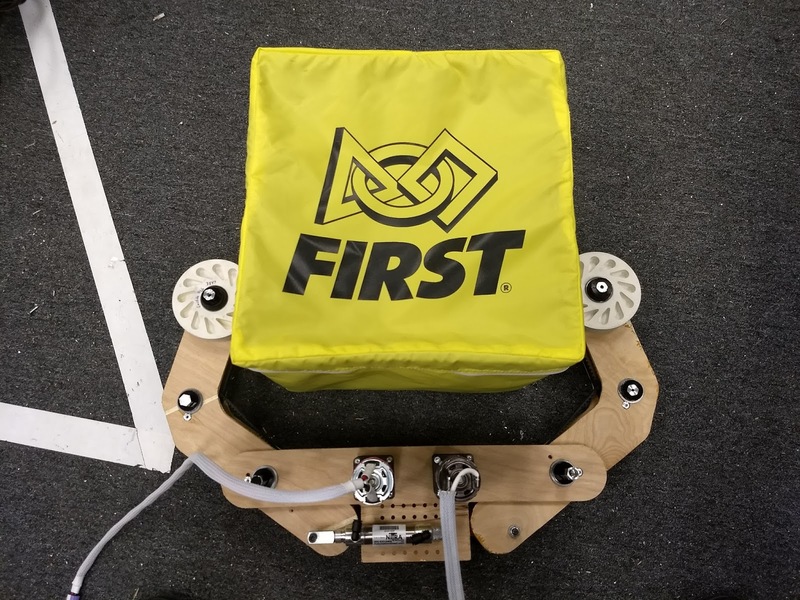 Gives a bit of insight into FIRST in Michigan and their 500+ teams but also just general FRC information that is great to know. The 2nd episode of this season was released yesterday. You can also subscribe to their RSS feed in slack to get updates that way. We actually didn't meet for the first time in recent memory. The roads were iced and we have a deep freeze for over 24 hrs which rarely happens in Houston. 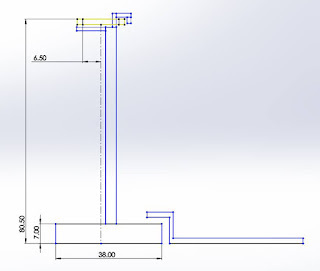 Since we can't work on our prototypes, we wrote out our entire current robot plan also their is some updated CAD of the virtual 4 bar intake at the end. - 2"+ ground clearance, it won't be great over the corner but shouldn't get stuck. Should be fine up the platform. - Not great up steep ramps but steep ramps are bad anyway. Arm may help us out of weird end game situations, forcing it in to the ground, etc. - current plan is to go with a sheet metal inverted west coast drive (cantilevered wheels on the inside, like 118 last year) to get us a bigger belly pan. 24" is small, our normal wheel wells wouldn't leave us much room and vertical electronics are annoying. - omnis makes it real hard for us to tip sideways, arm can right us if we tip forward or backward, hopefully we don't need to do that ever. - all sheet metal, all bearings for extension. - 3x 775pro on the arm with a disk brake so we aren't stalling the motors much. Gearing allows us to curl for the climb when we aren't lifting a partner. - still prototyping our final solution but worst case it's some version of a sideswipe intake (1114 2015). 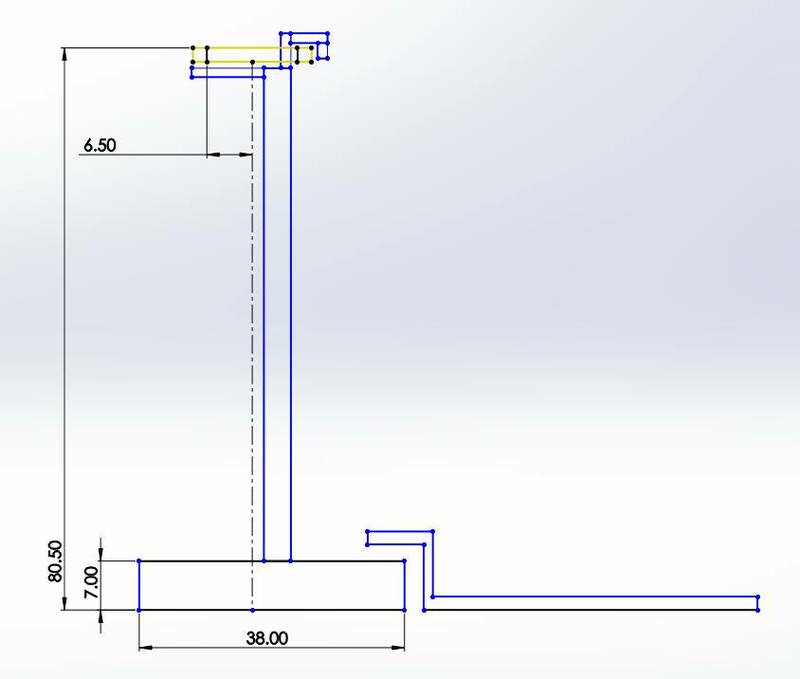 We want to get the virtual 4 bar intake(look below for a CAD sketch) working but it's definitely more complicated but it should let us intake 11" cubes easier. - Every cube in this game matters and time wasted trying to turn cubes is time not spent score. Drivers may be able to just approach cubes from a different angle to avoid the 11" face but probably not everytime. - intake is 2x 775pros, one for each side so we can spin the wheels at different speeds to help with I taking. - wheels should be able to launch cubes 2-3' for pushing them up to the scale (arm will rest them on the side of the scale for up tilted scales). May include a pneumatic punch if we need more height/distance. - intake opens and closes with pneumatics, let's us drop cubes and place them nicely. - hooks hard mounted to the arm extension. One on each side we can grab the square tubing from either attack direction. - hooks fold out or extend to give us more reach for the bar then we get from the single extension. - solo climb is a curl. That way we can climb second and as long as we can reach the rung we can curl away from the already hanging robot and both get points. - dual climb is a forklift tailgate that folds out the front of robot, forks are stored along the a-frame for the arm. - winch is attached to the tailgate so we can get our winch pull location as close to our partner as possible so our climb doesn't lean as much. - forks have ramps on the sides of them so teams can drive over them. - some type of retaining bar goes over the partner so they can't tilt off, this won't need to actually tighten to their robot, just prevent them from tipping up. -winch cable gets mounted to the same hooks we use for the solo climb, as we winch up the arm is back driven to allow us to get it height. - tailgate and winch can be detached easily match to match, so we can be lighter when we don't need it. - own our switch and the opponents switch as fast as possible and maintain the lead. - run cycles from portals to op switch and to the scale. -able to quickly grab cubes our opponents knock out of their cube zone. - have third partner maintain your own switch lead and score at least 3 cubes in the vault. -scoring on switches under defense will be hard since you have to get your bumpers touching the fence to be able to score (reasonably). Lots of spin moves. favorite alliance task breakdown right now. 1. Score in op switch and the scale, defend them from scoring in their switch. How much time each of those teams spends on each of their tasks and how efficient they are will decide the game. May need to call audibles and have #1 come back from far side and score your own switch to maintain ownership. The red sketches show the belts and shafts that would spin the wheels powered by the VP 180 degree adapter. The orange shafts show the movement of the two arms that will move the wheel plates in and out to compress the cube this is powered by a pneumatic cylinder since we only need about 90 degrees of rotation which is 45mm of belt travel. 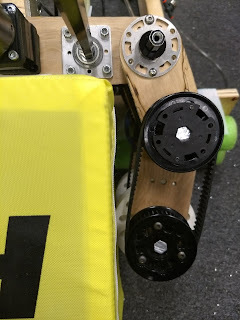 The green sketched belts are used to keep the wheel plate perpendicular to the motor mounting plate those 4 pulleys are directly mounted to the plates they are near and don't even touch the shafts they are around. Note these belt distances are done in CAD yet, this was just to figure out the stacking of all of the components. Many of the distances will change, for bolts, etc. This gives a large range of open and close in a very small vertical displacement of the wheels. Most of these pulleys will be printed, if needed most of these can be made from the hex versions but would required cutting a bearing hole into them. This will allow us to adjust how far we close and open the claw by allow us to adjust hard stops on the pneumatic cylinder motion (or arm motion). Just a short update of what we are working on. Our current plan is to have two seperate climbing methods depending on if we need to lift a partner or if we can climb alone. With a partner we will use our fork lift and winch to lift both our robots at the point between the bumpers. This will let us reduce the amount of tipping during the lift. 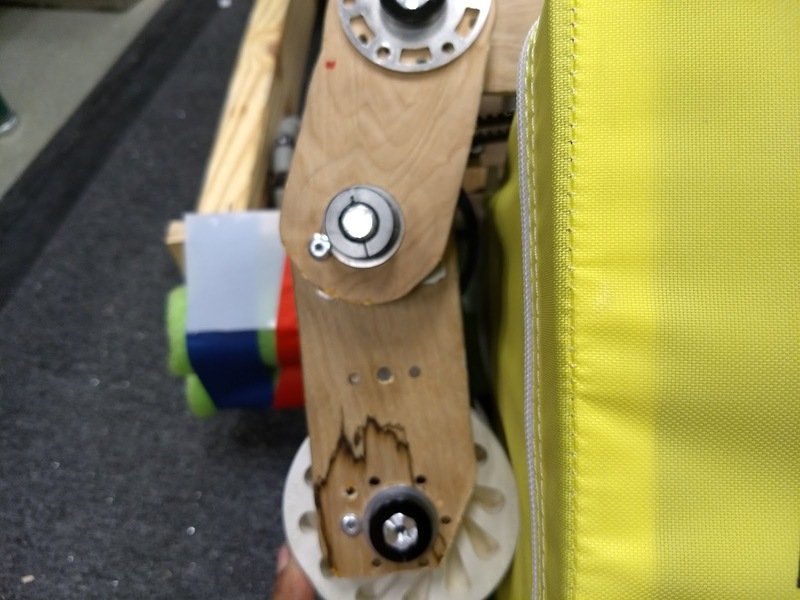 When we climb alone we will use a curl at our arm joint so that we can curl away from any robot that has already climbed or if they have bars mounted to their robots. Our intake prototyping has gotten a bit more complicated to be able to meet all our requirements. It uses a virtual four bar belt and a pneumatic cylinder to move the pivots and compress the cube. It also has multiple co-axial movements. 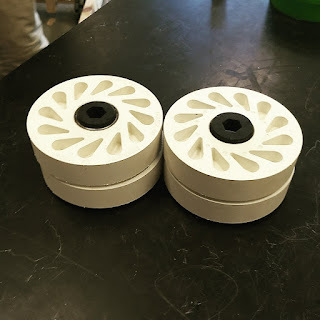 Should have it built tomorrow if we are able to print all the pulleys we need for it. 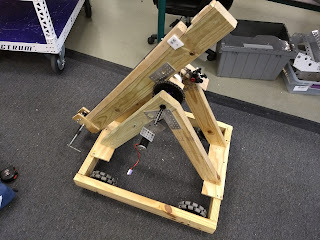 We purchased a lever chain hoist this morning so that we could test different lifting concepts without having a robot cable of lifting another just quite yet. Keeping a partner level is definitly going to be a challenge. We are going to continue working on our retaining device as well to help hold our partners securely close to our bumpers. 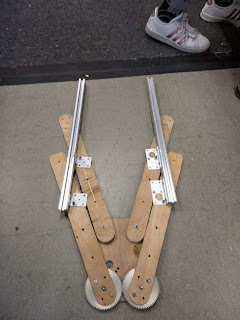 We do have tread on the two forks that we have under the partner robot as well. 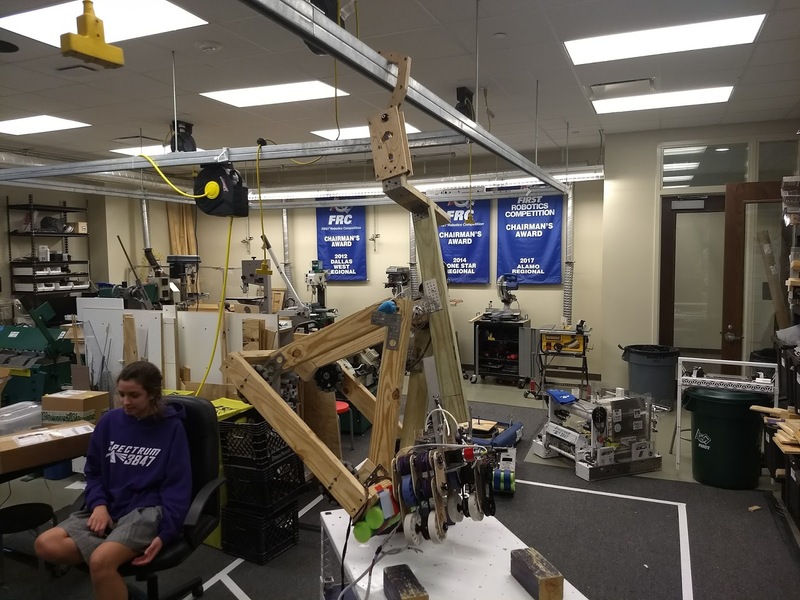 The robot with the arm weighs ~120lbs, the robot with the vise mounted to it weighs 140lbs. 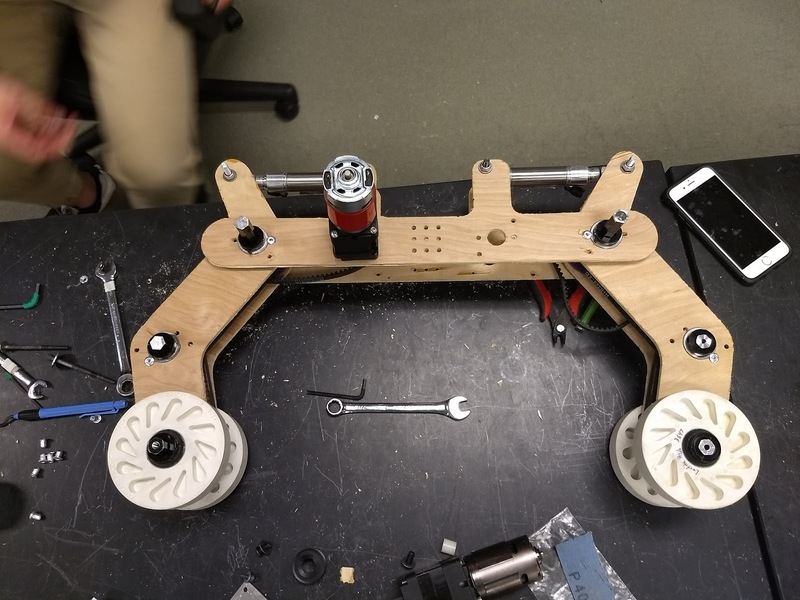 We will also need to make a robot with a higher Center of Gravity (CG) than this current partner bot. As the CG of a partner that you are attempting to climb is going to be very important. East Texas hosted 3 Robot in 3 Days teams and 118's Everybot team this year and they all headed to The Woodlands, Texas home of Texas Torque World Headquarters (FRC#1477) and had the first ever MCCC. A true "Week 1" competition. We had several of our alumni and friends up at the event and we were able to secure video of several of the matches. The fields were only the wooden version and weren't setup up perfectly (lacking exchange/vaults) but it gives you a good idea of how some matches may go. You can learn a lot from watching real robots play that you may not notice when you simulate in your head or with humans. 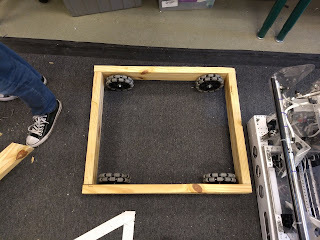 A great intake will make your robot much better than a great lift/arm/shooter/etc. The cubes like to slide on the carpet so test intaking by pushing your prototype towards the cube and not the cube towards the prototype. We're not sure if you call it a redesign when you never really started designing the first option. Today's design meeting led us back to our priorities of scoring cubes as fast as possible. Time is points in this game and the faster you can score cubes the more matches you should be able to win. There are 4 distinct cube scoring areas for each alliance. Three out of the four tasks are better suited to a shorter robot that can pick up cubes on one side of their robot and drop them off on the other at 2 different heights. Stopping your opponent from owning their switch is just as valuable to you as it to own your own switch since it's a plus 1 point differential for every second you prevent them from owning it. So having a shorter nimble robot that can score quickly in the 3 short zones while still assisting with the scale is a valuable robot for any alliance. 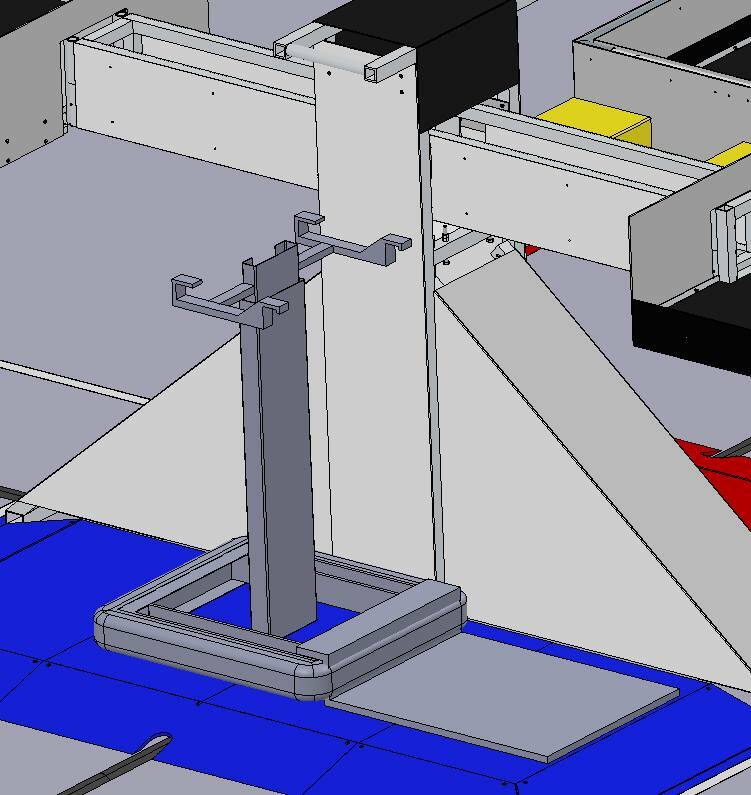 Here is a quick Solidworks sketch that shows how a robot might be built without a traditional elevator to complete the low tasks efficiently while still being able to put cubes in the scale. 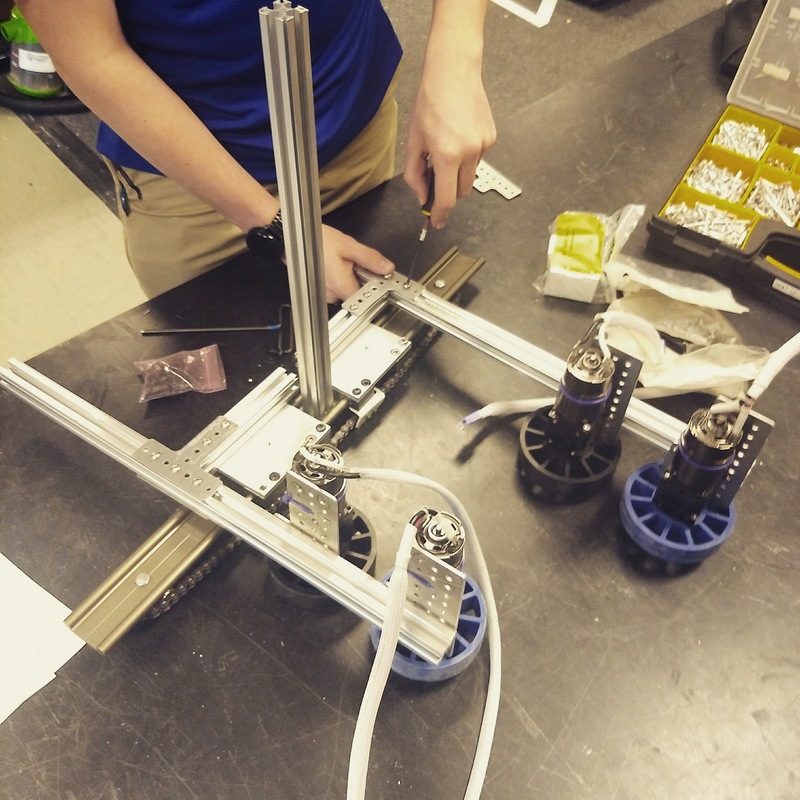 This design is heavily inspired by previous season robots from 233 and this past pre-season robot of team 2168. All the dimensions haven't been worked out yet but this gives an idea of a possible configuration. The 5 pink lines are 5 different positions of a retracted arm. The orange line shows an extended arm. 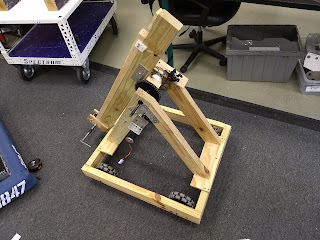 In the full retracted position this arm doesn't break the 16in frame extension rule and the only time you need to extend is when you are pointing almost vertical to be able to eject a cube into the scale. 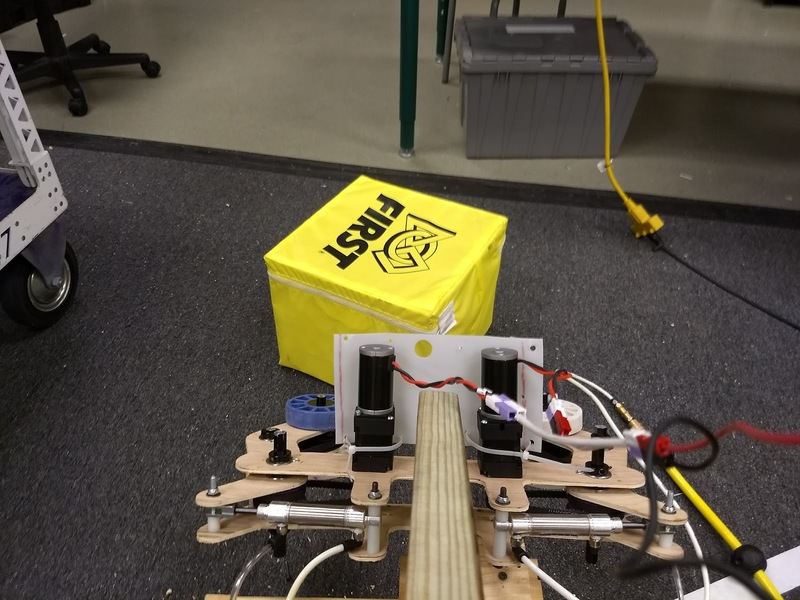 We may also experiment with being able to shoot cubes into the scale as well so we can be faster and not have to extend every time we place a cube in the scale. The current thought is we can also get away with a smaller frame with this design. Somewhere around 28"*24" instead of the full size 33"*28". 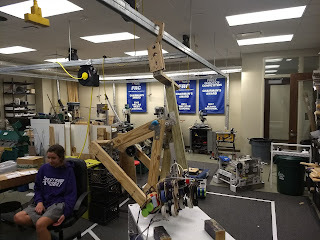 This new robot doesn't easily allow an integrated elevator/climber solution (not sure any elevator/climber is going to be that easy) so we need a new way to try to climb with our partners in nearly every match. JVN and the Robotwrangler's Hierarchy of Climber Types is a great read about the potential various different climber options. Our original Tailgate climber was a 13 on the scale. It relied on our partners driving on to the right spot for us to lift them and us both up. Our new idea is to try to go one up on the hierarchy and be a "14. 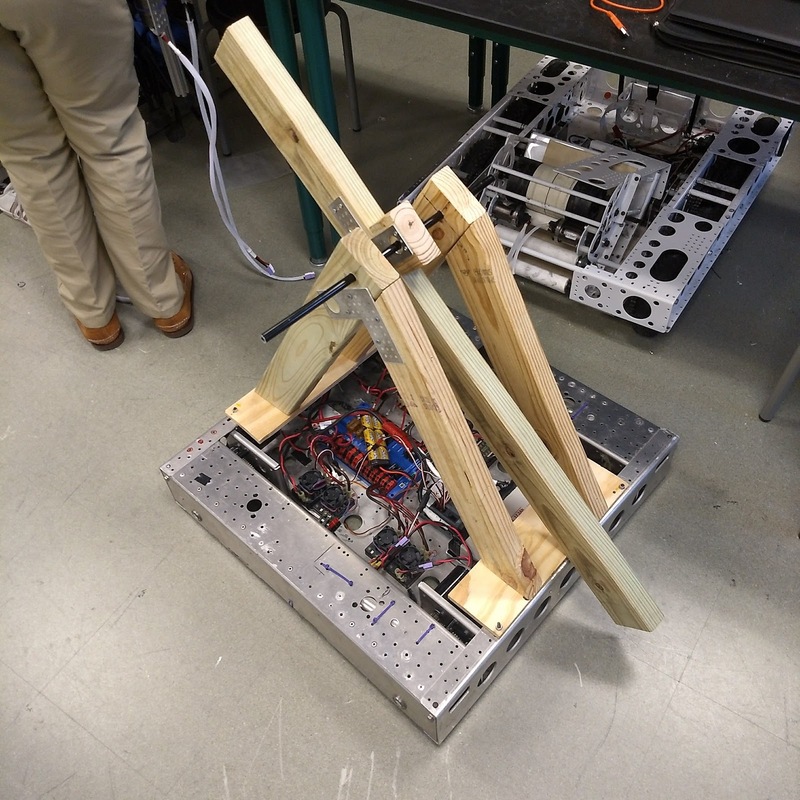 Help-A-Fridge Climber" where we are able to clamp onto a partner robot and bring them up the scale with us. This would also let us potentially be something similar to a "7. Versatile Basic Climber" where we clamp on to our partners and they climb us both up. The idea is to have fold our forks that we drive under a team and then a top clamp that we are able to clamp down on a partner. Today brought the first clarifications of multiple rules from the GDC in the Q&A. Two critical Q&As are Q4 and Q8. They clarify the definition of a floor and how the robot will be transposed to the floor. 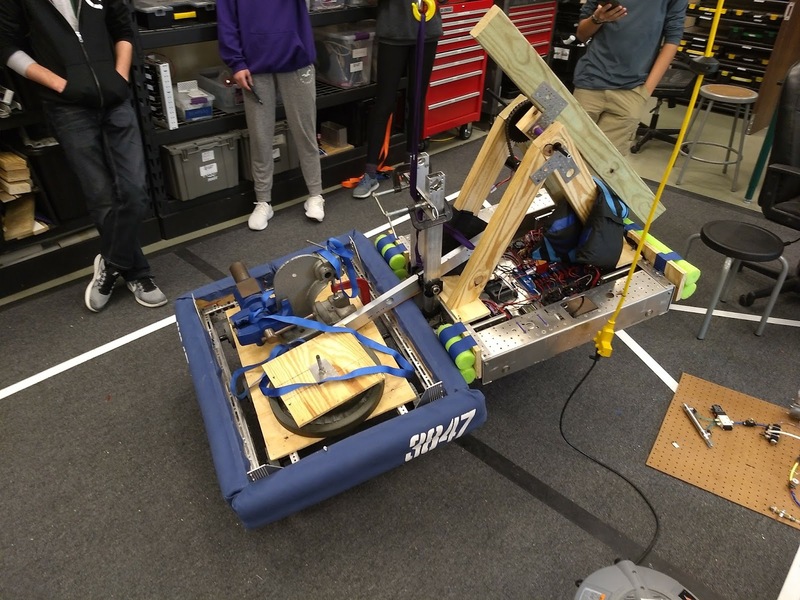 With these rules, its now okay to lower a tailgate (what we call a panel for lifting another robot) to touch the carpet in the platform zone and then lift them up on that tailgate. This is good news for a lot of designs. Before those rules came out we were working on a way to climb with a partner that didn't need to have the ramp on the carpet. This was the hook design we came up with. It can be improved by coming into the rung from the top and then backing up to secure yourself but we don't have a sketch for that yet. We'll be doing our design review tomorrow. We have taken this season slower since in the past we have been hasty in our decision making. We'll reevaluate where we stand after 5 days of thinking and dreaming about how Power Up is going to be played.